Shoe inserts are the most commonly used type of insoles. Whether you find the footbeds of your shoes uncomfortably hard, or your feet quickly freeze in the winter, or your feet suffer from perspiration during the summer, insoles offer a quick and cost-effective solution—to these as well as other complaints. Natural cedar is anti-bacterial, absorbs perspiration and has a deodorising effect. Cedar and bioactive silver ions ensure a powerful anti-bacterial effect. 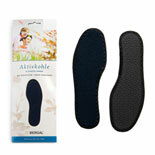 Durable charcoal insoles absorb foot odour inside the shoe. 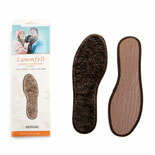 The classic way to keep feet warm in winter: lambskin insoles made of 100% lambskin. 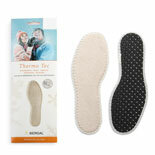 Thermal insoles made of soft and cuddly 100% fine-fibre polyester. 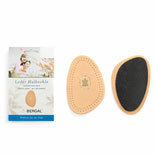 100% leather insoles for perfect wearing comfort. Made entirely of natural materials. Leather upper, cork bottom. 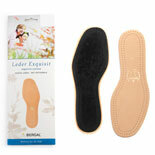 Solid gel insoles provide perfect, firm foot support. 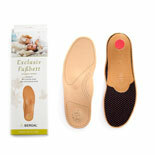 Special barefoot insoles for wearing closed-toe shoes in the summer. Walk in perfect comfort. This footbed helps foot muscles, sinews, and tendons relax. 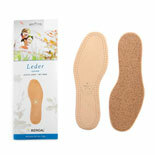 Leather half insoles feature real leather for better foot support. Soft cushioning. Heel cushions treat heel and ankle pain. Put an end to the pain of a low instep. This firm foam rubber pad relieves the arch of your foot. Sustainable, transparent and rewarded - our promises to you. Invite friends and get Premiums! You might suffer from footbeds that are uncomfortably hard, or find that in winter your feet quickly freeze in your shoes. You may also have to deal with foot perspiration. There are many different reasons for using insoles—they promise a cost-effective and fast-acting solution to all of the above complaints, and more. There are many different reasons that people turn to insoles. Insoles are, fundamentally, shoe inserts that promise quick relief for shoe-related foot discomfort. Insoles are cost-effective and easy to replace, and ensure precious comfort on an everyday basis. Take note, though—they should not be confused with orthopaedic shoe inserts, which, as their name suggests, are only made by licensed orthopaedic technicians. There are myriad types of insoles on the market. In addition to thermal insoles, charcoal insoles, barefoot insoles, gel insoles, sport insoles, and health insoles, there are also heel pads, gel pads, ball pads and toe protection pads. There are many different reasons that people use one of these kinds of insoles. Among other concerns, some individuals suffer from feet that get too cold in winter, while others, particularly those who stand or walk for long periods of time on a daily basis, desire a softer footbed. Of course, certain insoles also absorb foot perspiration, which in turn causes them to repel unpleasant foot odour. Other insoles are specially made to support bare feet in shoes, while others still prevent feet from slipping inside shoes. All of the above still does not account for the entire spectrum of available insoles. However, it should suffice for an initial overview of the benefits that insoles can provide. The German Bergal company is known on the market for its wealth of tradition. Staying true to its motto »wellness for the feet«, the company focuses entirely upon producing practical shoe inserts and insoles. These are available in visually appealing Newline packaging, tucked inside boxes. The company has been using this packaging method since the early 1990s, and in doing so setting standards in visual presentation and environmental friendliness. 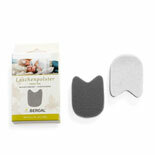 The attractive outer packaging also protects insoles from light exposure, which guarantees lasting high quality. There is a broad selection of insoles available; you are sure to find the perfect insole to address whichever problem you face. Your shoes may change over the years, but your feet will remain the same—insoles ensure that your feet will always be comfortable in your new shoes.